Are you thinking about a new composite deck, but wondering if a maintenance-free deck really is free from ALL maintenance? When the term “maintenance free” decking first came out years ago, manufacturers, suppliers, and builders all used this common marketing term. And while capped composite decking is still and always will be considered by many as zero maintenance, the legal teams of decking board manufacturers switched to a new term, low maintenance, for one reason: some consider standard cleaning of the deck surface (sweeping & hosing) as “maintenance”. Here’s a closer look at what it looks like to maintain a wooden deck vs a capped composite deck, and why many consumers choose to install a capped composite, AND how it is actually less expensive to install a capped composite deck over a wooden deck considering the ongoing maintenance costs of a wooden deck. At Custom Deck Creations, our decks are designed and constructed exclusively with high quality low maintenance capped composite decking (the latest and greatest technology in the decking world) such as Trex, Timbertech, and Azek, among others. We’re fairly familiar at this point with what is (or isn’t) involved in keeping a composite deck looking like new year after year. Let’s dive in. Wood decks look great when they are first constructed. The wood grain patterns are clear and vibrant, and the color of fresh wood is visually stunning and a pleasurable sight to behold. However, if you have ever had a newly built wooden deck, or know someone who did, you know how short-lived this beauty is. Within one or two seasons of rain, sun, and snow, the glory of a wooden deck starts fading. By the end of the first year after it’s built, the color of a wooden deck starts to turn to a lifeless and unattractive grey, no matter what species of wood was used to build it. The grain patterns and colors no longer pop out in a pleasing way. Instead, the boards begin warping and cracking, and the entire deck starts looking worn and unattractive. As the seasons go by, sun and wind, heat and cold, the use of rock salt for melting snow and ice, and the scraping of snow shovels against the deck surface all contribute to the deteriorating of the fabric of the wood itself. The once beautiful grain patterns start separating and producing dangerous splinters. Ugly cracks develop within the grain, and not only is the deck less attractive to the eye, it now becomes increasingly hazardous when you use it. Restoring the former beauty of a wooden deck means getting out the belt sander and spending long hours sanding down the wood until the grain patterns and colors reappear. Then, applying several coats of deck sealer to the surface (which really only slows down the process of fading and deterioration, not preventing it). The other alternative for preserving a wood deck is painting it. But paint covers up the grain patterns and wood color, defeating the very reason for using wood in the first place. Paint also doesn’t last forever. A painted deck needs repainting every 1-2 years. Before it can be repainted, old, flaking paint has to be scraped down with a wire brush and then, yup, sanded – no getting away from that. As wooden decks go through cycles of heat and cold, it is also inevitable for nails or screws to work loose in the wood. The decking then pops-up and curls from the joists below, causing trip-hazards and an unpleasant aesthetic look. Loose nails and screws also add extra time to the annual maintenance of a wooden deck. Before repainting or sealing the deck each year, you have to carefully inspect the entire surface, pounding down nails or driving new screws, so the decking is once again tight against the joists. All of this adds-up to hours and hours of time, effort, and expense every single year when you have wood decking. Capped Composite Decking is Free from Annual Maintenance. Really. Capped composite decking (such as Trex, Timbertech, and others) are significantly different than wood when it comes to fading colors, splintering wood grain, loose nails and screws, and the time and money needed for keeping a deck looking like new. Capped composite decking is made with a combination of wood and plastic. Trex’s composite boards utilize reclaimed plastic from plastic bag waste blended together with extra-strong adhesives. Finally, a layer of tough resin finish is applied to the surfaces of the decking material, producing truly maintenance-free decks. There is no sanding. No painting. No staining. No splintering. No warping. Ever. Besides the occasional wash with a hose or power washer, there is no annual maintenance. Ziltch. Zip. Nada. Capped composite looks brand new each and every year, year in and year out. In fact, most capped composite manufacturers include a 25 year warranty, longer than most people own their home for. Capped composite doesn’t break-down, splinter, or fade, no matter how much sun, rain, snow, or ice it receives over the years. It also holds fasteners tight, so nails and screws don’t come loose over time. Maintenance-free decks do require a little care and some regular cleaning, but it is nothing like the effort or expense needed for maintaining a wood deck. While this section is specific to Trex decking, the information applies generally across the board to most every capped composite decking brand. Your capped composite deck will look as new as the day it was installed for years to come. With capped composite decking, a little goes a long way in keeping your deck looking brand new. Because a deck is located outdoors and is exposed to the elements, some cleaning is required for wiping away dirt and debris. However, because capped composite decking is so durable, this process only takes a small amount of time and effort, especially compared to a wood deck. Sweeping with a good outdoor broom and hosing-down a Trex deck with a garden hose easily cleans away average dirt build-up. If the deck has not been swept or hosed down for some time, or if it gets especially dirty due to heavy use or nearby construction, use of a manufacturer recommended cleaning product quickly gets the job done. Trex recommends composite deck cleaning products only on the first generation of composites (installed before 2010), otherwise just utilize soap and water. Check with the manufacture or your deck builder for recommendations for your specific decking product. You can also use a warm, mild, soap and water solution for cleaning dirt on the high-performance Trex products, including Trex Transcend, Trex Select, and Trex Enhance. Pressure washing also works, but be sure to always use a pressure under 3100 psi. For stubborn stains in small areas, you may need a soft bristle brush for removing the stain from inside the embossed pattern on the decking surface. Do regularly clean away pollen and dirt with a garden hose and soap and water as needed to prevent mold from forming. Mold can form on any surface, including any decking brand, that harbors food for mold such as pollen and dirt. Just hose it away. Do remove all soap residue after cleaning to prevent a film from appearing on the decking surface. Do use a plastic shovel for removing snow and ice (if desired), not a metal one which could scratch the surface. Do use rock salt or calcium chloride for melting ice and snow on the deck (if desired). Trex decking is built to stand the use of snow and ice melting products. Don’t use solvents like acetone for cleaning your Trex deck or railings. Don’t use a pressure washer with pressures above 3100 psi. Trex low-maintenance decks are truly free from all expensive and time-consuming yearly maintenance, because they never need sealers, painting, sanding, or re-nailing. Ever. Trex decking does not warp, crack, splinter, or fade. All a Trex deck needs for retaining its original luster is a little regular cleaning and care, and your deck will keep on looking as new as the day it was built. For more information about how to maintain a deck built with capped composite Trex products, or for a free deck design in Southeastern Michigan, contact Custom Deck Creations, anytime. https://customdeckcreations.com/wp-content/uploads/2017/11/Low-Maintenance-Decking-Michigan.jpg 318 847 Custom Deck Creations http://customdeckcreations.com/wp-content/uploads/2017/07/Custom-Deck-Creations-Logo-3.jpg Custom Deck Creations2017-11-03 01:44:562018-02-20 03:32:12No Sanding. No Painting. Ever. But What Does "Maintenance-Free Decking" Really Mean? Thinking about extending your home, adding to your living space, building a new backyard retreat? The good news is, it’s easy to answer the “but how do I pay for it?” question! There are many financing options available to homeowners for building a deck or patio and improving their lifestyle, while also adding value to their property. Adding a deck is an improvement to your home which literally pays for itself if you ever sell your home. In fact, adding a capped composite deck gives one of the best returns on investment of all home improvement projects. Most homeowners see an eighty percent return on their investment in their capped composite deck or their patio when they sell their house. A new capped composite deck is really an outdoor extension of your home’s square footage, creating an area to relax with family and entertain your friends, without ever having to leave your home. Having such a get-away space this close to home also saves money by avoiding expensive bar tabs, event rentals fees, or restaurant pricing, meaning your investment starts to immediately pay for itself. And with the uniqueness of having a custom deck or patio added to your own home, you’ll have a new living space to show off to any potential buyers down the road that no one else has. Bragging rights! Your home is an important part of your life. Improve your home, increase your home’s value, and pay for it over time. Here are six financing options for a new backyard deck or patio. Some deck builders that have been around for awhile offer financing to their customers, probably one of the simplest and easiest methods to finance your next job. Be aware thought that builder financing programs vary greatly in each builders’s specific offerings. Not every builder offers financing, so be sure to ask your builder if they do. Some builders themselves charge a financing surcharge, a fee paid directly to the builder, just because you’re financing your project. Look for a builder that doesn’t charge such a fee. Others may require a cash deposit, increase the project price, or delay building your project due to a lengthy approval process. Be sure to ask your builder the details of their financing program. Custom Deck Creations does offer multiple financing options, and we do not charge any financing or application fees. There are no additional fees from us if you finance. Many of our financing options have low or no fees nor interest if paid back over 2-4 years. Our financing application process is simple and fast, and we will walk you through the entire process, which only takes a few minutes. We accept all ranges of credit ratings from excellent to bad. There is no delay in your project if you finance. Builder financing is the most popular option among our customers. We’ll walk you through exactly how to apply for financing and how cost effective it is when we meet. At Custom Deck Creations, once we have you approved for financing, we can get started immediately building your new deck or patio. You can use our financing system for all payments, including the initial deposit, progress payments, and the final payment. You do not need any cash to be eligible for financing with Custom Deck Creations, nor do you need any cash for us to begin or even complete building your next deck or patio. Custom Deck Creations does not receive any sort of kickback or financial gain no matter the type of financing you choose. Another popular option to finance your next home improvement project is a home improvement loan. A home improvement loan, also known as a Home Equity Line Of Credit, or HELOC, is a loan in which you borrow against the equity in your property but without paying off the original mortgage. With a HELOC, the lender gives you a line of credit which you draw from as needed, and you then make monthly repayments of principal and interest. Many banks and credit unions offer home improvement loans, and don’t require you to be a member in order to qualify. A good place to get started is by asking your existing mortgage lender, your own bank, or a local credit union. HELOCs often have a period of ten years during which you can continually draw funds out of it, and typically have a repayment period of 15 years. Unlike a personal loan, a HELOC is secured against your property. Interest payments are often tax deductible. Home improvement loan options are also available for those with limited or no home equity. Personal loans are loans made to an individual by a bank, credit union, or a large online financial lending company like SoFi. Personal loans make sense for new home owners who do not yet have much equity in their property, making home equity lines of credit (HELOC) and second mortgages unavailable. Most personal loans have repayment time frames of five to seven years, which generally means the monthly payment amount will be higher than with certain other financing options. However, if you have good credit and monthly cash flow, a personal loan also adds up to lower interest charges over the life of the loan. Applying for a personal loan is often simple and straightforward. The loaning institution runs a credit check and asks for verification of income – these are the primary factors determining eligibility. Personal loans are secured by collateral such as a property deed, and the interest payments are usually not tax deductible. If interest rates have gone down since you bought your home, refinancing your home mortgage is a good way of getting access to funds for upgrading your property. In this case, a mortgage refinance can supply you with money for building a deck or patio, and it can also lower your monthly mortgage payments at the same time. A mortgage refinance uses your home as collateral for the loan, and is designed for large loan amounts, so it is not always the best option. Using a mortgage refinance for smaller home improvement projects means you are financing a small project in conjunction with a large debt spread out over many years. This can add long-term interest and financing costs to the project, making the improvement cost more over the long-run. A second mortgage is also known as a home equity loan, and is similar to a HELOC. However, with a line of credit, you only draw out funds as you need them. With a second mortgage or a home equity loan, you receive a lump sum of money instead. Second mortgages are a sensible financing option when you already have a good mortgage interest rate and do not want to refinance your original mortgage. However, the interest rate on second mortgages is not always the same as the rate on the first mortgage, and may even be higher. However, you can deduct your interest payments on your tax returns when you finance with a second mortgage. Getting a second mortgage also requires having sufficient equity in the property, so if you are a new home owner this option may be ruled out for you. The loan application process for a second mortgage is usually also more complicated than for a personal loan or HELOC, and it may involve having the home reappraised. Credit cards are another way of paying for improvements to your house. One advantage of using a credit card can be large reward program credits, giving you steep discounts on air travel along with other perks. However, credit card interest rates are often expensive, so if you use a credit card to finance a new deck or patio, make sure you are able to pay off the balance each month in order to avoid costly interest payments. Still confused about financing options? No sweat! There’s a ton to comprehend here. If you’re in Southeast Michigan, contact Custom Deck Creations today and we’ll walk you through all of your options to finance your new deck or patio, and find an option that works best for you. When it comes to adding a deck to your home, you have multiple options to use for your “decking” material, or the top visible layer of a deck. Composite and wooden decks remain the two most popular options, but which is “better”? Which should you have installed for your new deck? While these earlier pre-2010 versions of composite decking had many advantages over wood decking, they were still prone to fading, staining, and molding over time, just like their wooden counterparts. These earlier generations of composite decking also required annual maintenance – deep cleaning, painting or staining, and structure maintenance – in order to keep the deck safe, retain color, and ward off mold and mildew. The surface was also soft enough to scratch when moving deck furniture around or from energetic play by kids and pets. In 2010, Trex became one of the original manufacturers of capped composite decking. Many manufacturers followed suit by capping their composite boards, while the majority of un-capped composite boards have now been discontinued. By applying a long-lasting and extremely hard coating to the surfaces of the planks, the boards now don’t fade, stain or mold, grain patterns are retained, and the decking does not split, develop cracks nor splinter. When first installed, traditional wooden decking looks great with its rich colors and natural grain patterns. But as anyone who has an all-wood deck can tell you, wooden decking does not retain its initial beauty for long. Wooden decking requires yearly maintenance (hours of sanding, staining and painting) to prevent the surface from turning to a grey and unattractive color, no matter what species of wood is used. The grain patterns also fade over time, turning into cracks and hazardous splinters, an especially dangerous condition if there are children who play on the deck or if you ever want to walk on your deck in bare feet. In order to retain the color and grain patterns, and to prevent splintering in wooden decking, homeowners have to perform yearly pressure washing, followed by an application of stain or sealer. Even with these treatments, problems often develop over time. Wood is also susceptible to rot, termite infestation, and ultimately wear of the decking boards in heavily traffic areas. This leads to expensive and time-consuming inconvenience of repairing or replacing worn and damaged deck boards. And as individual deck boards are replaced, the color of the new boards will not match the rest of the deck. An unmaintained wooden deck can become a safety hazard and an eyesore only a few years after it is built. Wood ends will start to curl up and nails will begin to pop out creating an uneven and unsafe structure. Building a wooden deck also requires cutting down fresh trees, contributing to deforestation and creating ecological damage, affecting the wildlife dependent on these forested environments for their survival. Capped composite decking, with its durable capped surface, is a breakthrough alternative to both all-wood decks and earlier generations of composite decking. Utilizing this revolutionary new product also helps the environment – Trex alone saves 400 million pounds of plastic and wood from landfills each year. A single 500 square foot capped composite Trex deck, for example, contains 140,000 old recycled plastic grocery bags! This puts Trex decking among the biggest recyclers of plastic bags in the U.S. The manufacturing process of composite decking is also engineered for maximum recycling of industrial waste as almost all byproducts are reused within the factory itself. Ecologically damaging chemicals are kept out of the production process, resulting in low levels of waste, energy use, and a small CO2 footprint. Trex has never cut down a single tree to manufacture its decking boards. The surface capping on the new generation of Trex composite products is exceptionally hard and durable, resulting in a finished deck which can hold up to years of summer sun, freezing winters, and heavy-duty family use. There is no maintenance needed on these decks beyond sweeping away fallen leaves with a broom and an occasional rinse with the garden hose to clean-up spills and other messes. For a well-maintained, all-wood deck, useful lifespans ranges from as low as 8 years and up to 20 years or more. However, longer lifespans for wooden decks are only achieved with regular maintenance. By comparison, high-performance Trex composite decking has a lifespan of at least 25 years, guaranteed by the manufacturer. In reality, a new-generation capped composite Trex deck may have a lifetime of as much as 30 to 40 years. Even more importantly, achieving this long life span does not require the investment of time and money for yearly maintenance, and the need for replacing individual deck boards due to wear or breakage is virtually eliminated. Hundreds of matching or complimentary deck railings, stairs, trellises, and pergolas are available to chose from – all also made from composite materials, extending their life to last as long as the deck itself. 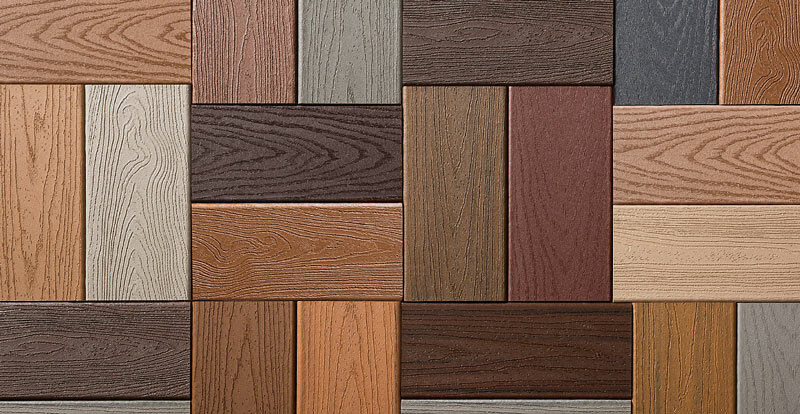 There is also a wide selection of colors and grain patterns to choose from when building a capped composite deck. Deck boards can be laid-out in pleasing geometric designs, adding an extra dimension of visual appeal to the finished deck. While the initial cost of a composite deck is slightly more than an all-wood deck, the time and maintenance costs required for a wood deck actually exceeds that of the initial cost of a composite deck within just 3 years, making composite decking the best bang for your buck. Custom Deck Creations is an exclusive builder of custom decks in Michigan, using the newest generation of capped composite products, including Trex and TimberTech. Call us today for a free design and a free quote for your new deck. As decks age, they can frequently become structurally unsound and not safe. Decks with rotting framing members, spongy deck planking, and inadequate lateral bracing can result in structural collapse and serious injuries. At their 5 year old mark, decks should be inspected by a licensed contractor who can verify structural integrity and catch problems before they turn into a catastrophe. Decks older than 10 years need a yearly inspection. Custom Deck Creations offers free deck inspections throughout the entire Southeast Michigan, helping you keep your deck safe and sound. You can also do your own deck inspections at other points in the life of your deck, and you do not need to be a construction expert to do this. All you need is a basic understanding of how decks are built, a few simple tools, and a bit of time, and you can get an idea of just how safe your deck is and whether or not it is time to call for expert assistance. Concrete footings or piers are the foundation of a deck. They’re poured in excavated holes under the local frost line. Wooden posts are attached to the concrete footings. Some decks are built closer to the ground with beams connected directly to the concrete piers. Any lumber buried underground must be below-grade pressure treated. All other lumber used to frame your deck must be pressure treated. Decks are either freestanding (not attached to your home) or ledgered (attached to your home with the use of a ledger). Ledgers are boards bolted to your home’s rim joist. Ledgers are usually made with a 2″ x 8″ or 2″ x 10″ board. An improper ledger attachement is the #1 cause for deck failures. Beams are large framing members, often 3″ wide by 8″ or 10″ deep, sitting on and connected to the tops of the posts. They carry the weight of the joists. Joists run perpendicular to the beams and rest on and are connected to the tops of the beams. They are usually made with 2″ x 8″ or 2″ x 10″ boards. Lateral braces are framing members attaching posts to beams at a 45 degree angle, preventing the deck from moving side to side. Decking boards are the planks you actually walk on. Decking runs either perpendicular or at a 45° angle to the joists. Decking should always be screwed in at each joist intersection, attaching the decking to the framing below. If your framing structure is sound but your boards are warping, rotting, or are nailed down, replacing just your decking boards is a great money savings alternative to replacing your entire deck. Staircases, lighting, pergolas, railings, and banisters (spindles) are the final components of a deck. Stair stringers are the large, notched pieces under the stair treads. Common sense can often give you a good idea of how well your deck is aging. If the deck sways or shakes while you walk on it, obviously, this is a bad sign. However, some signs of aging are harder to detect, and a closer look at the structure by a licensed contractor may reveal problems in the making. The only two tools you really need for inspecting your deck are a strong flashlight and an awl. If you don’t have an awl, a small screwdriver will do the same job. Start your deck inspection by looking at the posts/piers. Check that the top of each pier is level and that the bottom of the pier extends below ground, or is still attached firmly to a concrete pier. Concrete footings should sit below the frost line (in Michigan, this is 42″ below grade). Short of digging 4′ deep around each post, dig down a foot or two and inspect the integrity of your posts. Look for rot or for wood that has already rotted away. If you dig down and find that the bottom of any pier is exposed, it needs additional concrete poured under it. Decks in Michigan should not sit on pre-formed concrete “pyramids”, concrete forms that sit on the ground. Decks built to code are framed underneath with pressure-treated wood or steel. Pressure treated wood resists rot and lasts much longer than non-treated wood. If the wood is pressure-treated, it may have tiny, regularly spaced perforations all over the surface, and may still have a green or brown hue to it. Take note of whether or not the framing of your deck is pressure-treated. If it is not, the deck will have a much shorter lifespan. Next, use a level and check if your posts are still plumb (vertically level). Be sure to check two adjacent sides of each post for vertical placement. If the deck is attached to the house, the ledger is an especially important area for inspection. Rotten ledgers are the biggest cause of deck structural failures, allowing the deck to pull away from the house and collapse. The ledger should be attached to the house with lag screws or hex bolts, so have a close look at the surface of the ledger and determine whether this type of hardware was used. A few nails may have been used to temporarily hold a ledger in place while constructing your deck, but bolts should always be present on your deck’s ledger board. If your ledger is attached only with nails, do not use your deck again until a licensed deck builder inspects your deck. This is a major structural problem with impending catastrophic deck failure. Examine the ledger carefully for signs of rot, mold, or fungus growth. If any areas looks bad, use the awl or slender screwdriver and see how far you can press the tip into the wood. If it goes in easily more than ¼ to ½ inch, this is a sign of rot. Use the awl for checking any other suspicious areas of the deck, as well. Beams under a deck should not bow, and if they do, this is a sign they are beginning to fail. Bowing beams indicate the beam is inadequately sized for the weight of the deck. Visually examine the bottom edge of beams for signs of bowing. You can also pull a string between the lower corners at each end of the beam to check for bowing. Deck beams should also rest on top of posts, not attached to the sides of posts. Beams attached to the sides of posts means the entire weight of the deck structure, and any furniture and people on top of the deck, is completely resting on the bolts used to attach those beams to the posts. Attaching beams to the sides of posts used to be code, but any new decks built now must have the beams rest on top of the posts. If your beams are attached to the sides of your posts, we suggest a licensed contractor inspect the integrity of such a connection. If your deck is more than three feet off of the ground, there should be lateral bracing at each post/beam connection (except for posts closest to your home for ledgered decks only). Bracing prevents side-to-side shifting of the deck structure in wind or if there are a lot of people on your deck moving around. Check how securely lateral bracing is attached at the posts and beams. Joists should be spaced every 16″. Joists spaced farther than 16″ (i.e. 24″) was once code-approved. If your decking boards are each still securely screwed in at each joist/board intersection, you’re likely ok here. However, know that joists spaced farther than 16″ will result in a premature life of your decking boards. Walk around carefully on the surface of your deck and check for decking which is spongy or poorly attached to the joists. Also check for splintering of wood, and use the awl for determining if decking is rotten. You may notice nail heads which are sitting up above the decking, try to hammer these back in to prevent cutting your feet on them. It may also be possible for nails or screws to appear flush with the decking but work loose below from a rotten joist. Look out for boards that are warped or splitting as well. It is possible to replace single decking boards, though matching color will be the hardest part. If any decking moves away from the joist or gives out under your weight when you walk on it, it is overdue for repairs. As you examine the decking, check how well the deck sealer, paint, or finish is holding up (if your decking is wood). The finish on wood decking is important for preventing rot and splintering of the wood. If you are lucky enough to have composite decking, such as Trex, Timbertech, Azek, or others, your deck does not ever need an application of sealer, paint, or other finish. Woo hoo! 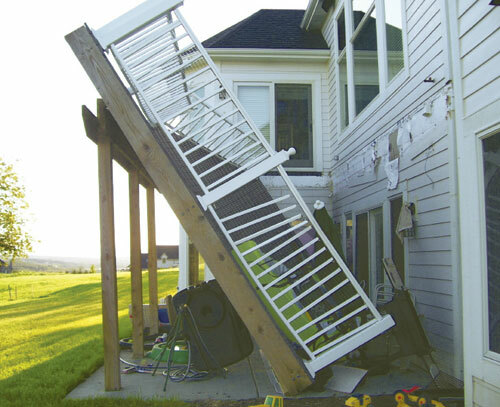 Railings are vital for preventing people and pets from falling off of a deck. Unfortunately railings are a frequent problem area on older decks. Carefully test the railings and see if they move to any significant degree when you shake them. Look for missing railing slats/balusters/spindles, and measure the distance between them. There should not be 4″ or more space between them. If slats are spaced farther apart, they pose a hazard for children who can get their head stuck in them, or fall through them. In Michigan, any deck higher than 30″ off the ground is required by law to have railings (for safety purposes, we suggest any deck higher than 9″ off the ground should have railings). Carefully walk up and down all staircases and test for any give in stair treads. The riser space at the back of each stair should be completed with a stair riser board, but if not, no gap 4″ or larger should exist. Stair handrails should be no more than 1 ½ inch in diameter, and should be “grip-able”, typically round. Sometimes, deck staircases have 2″ x 4″ cocktail railings (which we love! ), and should be complimented with a grip-able round handrail. Examine the hardware attaching handrails to posts. Fasteners should be tight and secure. Look at the underneath of stairs, checking for rotting stair stringers and gaps between the top of the stringer where it might be pulling away from the deck. Stairs are often installed improperly. Decks can be enjoyed for decades if properly maintained. If you have an older deck, or just moved into a new home, have your deck inspected by a licensed deck builder at the five years mark, and every year once it is over 10 years old. If you are in the Greater Detroit Metro Area, Custom Deck Creations can inspect your deck for free! Contact us today and schedule an appointment. Schedule your FREE Deck Inspection Today!